I love cooking, and one of my non-numeric long-term goals is to find a way to incorporate cooking and eating well with weight maintenance - specifically, I want to get away from my binge eating past where eating something I liked meant eating a ton of it very quickly. I have been learning about portions and focusing on textures and flavors over quantities, and so far I have done well. I have really wanted seafood lately, so for this week's recipe, I turned to the giant tome next to my bed: an anthology of M. F. K. Fisher's works, including a book called "Consider the Oyster." 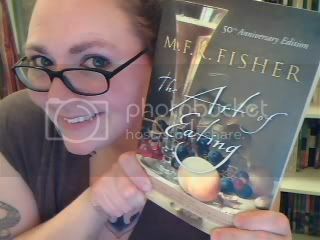 M. F. K. Fisher was a food writer and all-around brilliant lady whose passion for food and love for life inspire me. "When I write of hunger, I am really writing abut love and the hunger for it, and warmth and the love of it, and it is all one." I grew up on the Connecticut shoreline, so something I have had a hard time adjusting to in Chicago is the lack of fresh seafood. I'd never even heard of tilapia before coming here, and it's essentially all you can get (besides shrimp) without going to a specialty store. There's a market that I pass when I take the El downtown that has a large banner out front advertising lobster tails for nearly $30 a pound, and that amazes me. Back home, lobsters were $3 a pound all summer long - and they weren't just tails, they were whole and at least five pounds each. Growing up, I'm not sure we ever even bought fish. My dad would spend a day every summer with a few friends on a chartered boat catching striped bass, and the captain would clean and filet the fish right on the boat. We'd have enough fish to last through the winter, and it was unbelievably delicious. Tilapia, on the other hand, is bland. It looks like fish, but it sure doesn't taste like it - maybe it's because I've been so spoiled, but I think I might be able to taste all the traveling it had to do to wind up in these grocery cases. Yesterday, in search of some higher quality fish, I went to Whole Foods, and left with five shrimp, five scallops, and four oysters. The fate of the shrimp and scallops has yet to be decided, but the oysters I prepared à la M. F. K. Fisher, a recipe simply but aptly titled "Oysters and Onions." Oysters are supposedly a romantic Valentine's Day food, but since I'm unattached, I got to enjoy mine with onions and no fear of offending anyone with my breath. Slice enough small white onions to cover half an inch in depth the bottom of a skillet; pour half a pint of oyster juice over all and let simmer until onions become transparent. Add pepper and salt and a tablespoonful of butter; cook until butter melts. Spread over onion base a solid blanket of blue point oysters ... about forty ... and cook with lid off for five minutes. Place lid on and cook until oysters begin to scallop. Serve on toast with pancake turner, so as not to disarrange the layer ... No duck hunter who pretends to be half a man can face the crack of gray dawn better equipped. The ellipses are her own, and I love them - she often inserts anecdotes and asides in her stories. Her book "How to Cook a Wolf" was written during World War I but revised and republished during World War II, and the new edition is absolutely full of notes, to the point where the text is double it's original length. Her personality is so wonderful, though, so I don't mind the updates and changes in the least. Since I had four oysters and not forty, I used a small pan with fewer onions and less butter. But it was just as delicious. I also bought one French roll and broiled it to stand in for the toast. It was the first time I'd had oysters, and I liked them - I still prefer mussels, I think, but this was fun to try! I forgot to take a picture, but I don't think that's too bad today - both the recipe and the presentation were so simple, I'm sure you could picture it yourself if you wanted to. What about you? Are you cooking up anything special for Valentine's Day? i've been craving a serious bowl of seafood chowder (new england style) and this post reminds me that it's time. i'm not an oyster fan but doing the mussels as you mentioned would be beautiful. i'll have to look this book up! Souns like you had fun! For me Valentine's Day is hard. It used to be about chocolate, cookies, cupcakes etc. This year I'm just wanting to avoid it all. My mom owns a fish and chips restaurant, but because we live wayyy in land it's not fresh fish. We serve Halibut and Haddock, and I am one of those people that likes bland fish - because I like to flavour it myself. I always miss my Mom's fish - although it's fried I really miss it when I'm not home!! My Valentine's dinner will be super boring ordering into my hotel room. I'm really missing home and being able to cook!! I love fresh seafood. On our honeymoon on Macinac Island (off the Upper of MI) we had the best fresh scallops from Lake Huron that were so fresh you could cut with a butter knife. YUM!!! I love seafood :) YUMMO!